North East Aberdeenshire Members' Centre holds a variety of events throughout the year. Here are a few of our recent sucessful events. Cecilia Dunbar Kilburn: Sculptor, Shopkeeper and Lady Sempill: The Craigievar Castle Collection of Pottery in Context. Visitors to Craigievar may well have wondered why there is a collection of modern ceramics designed by some of the leading artists of the mid 20th Century. Doesn't it seem a little out of place in the baronial hall? 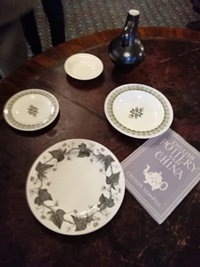 A talk hosted by North East Aberdeenshire Members' Centre in Haddo House Library on 19th March and given by Sue Taylor, a ceramic historian and volunteer helped explain all. The collection is due to the interests of Lady Cecilia Sempill, who as Cecilia Dunbar Kilburn (before she married William Forbes Sempill, 10th Baronet Forbes of Craigievar in 1941) was a sculptor and had co-founded the London shop "Dunbar Hay Ltd". This shop provided opportunities for graphic artists and students from the Royal College of Art including Eric Ravilious, Eric Bawden and Enid Marx, to showcase their designs, including furniture, furnishings, ceramics, fabrics and patterns. The shop closed in 1940 and was destroyed during the blitz, but Cecilia maintained her interest in modern design and kept contact with her artistic friends. As a result many of the furnishings, decoration and utensils at Craigievar feature their work. The talk gave a fascinating insight into some of the lesser known recent history of the castle, illuminating the significance of objects which might otherwise pass unnoticed during a visit. 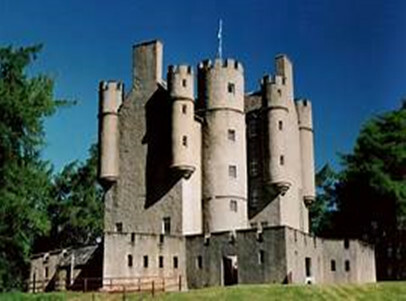 Braemar Castle - telling a story of Scottish history; Power, politics and fashion. There was an excellent turn out of members and visitors in the glorious Gallery at Fyvie Castle to hear Prof. Ian Davidson, author, retired specialist in heritage conservation for the National Trust for Scotland and now a Visiting Professor at Robert Gordon University, and a well-known authority on building conservation, explain how Braemar Castle - why it exists and how it looks - illustrates pivotal moments in Scottish history. Why is it there? - to send a message that the 2nd Earl of Mar was back in charge of his lands after his previous exile. Why isn't it as pretty as some of the nearby Highland castles? - because it was an army barracks for many years to make sure there were no more Jacobite uprisings. Why is it still standing and why has there been some attempt to romanticise it? - because of the great flowering of Scottish cultural tourism in the 19th Century when the castle became a "party house" for the Farquharson family and backdrop for the Braemar Gathering. Now in a state of disrepair, the castle is managed by Braemar Community Ltd. They have been successful in securing funding from the Heritage Lottery Fund to repair the harling, improve the grounds and build a Visitor Centre with 21st century facilities to ensure the Castle remains a valuable asset and at the centre of the community. All great, historic houses have their secrets and Haddo House is no exception. During a talk on 15th January, Simon Welfare shone the light on some of the secrets that have been lurking in the attics at Haddo. Seemingly innocuous objects, stored away and forgotten served to illustrate significant events and the prodigious talents of the Gordon family over the years - a picture of the General Assembly of the Church of Scotland, testament to the diplomatic skills of the first Marquis and his wife Ishbeal, who helped mend divisions in the church at the request of the King - a wonderful train set, representing a lifelong passion for railways shown by several members of the family and boxes of costumes and fabrics relating to the love of theatre and the arts for which Haddo has become famous. A delicious afternoon tea was included and the many attendees all agreed the event was well worth braving the nasty weather. The first Sunday in December always sees the Members' Centre Carol Service in Haddo House Chapel. This is always a popular event, signalling for many the beginning of the festive season. The service, led by Rev. Will Stalder, included performances by violinist Miriam McDonald and the Haddo Choral and Operatic Society junior choir "Haddo Voices" as well as readings and poems telling the Christmas story. Of course there was plenty of opportunity for the congregation to raise their own voices in familiar carols. Tea, coffee, mince pies and shortbread served in Haddo Library made sure everyone left suitably refreshed and full of Christmas cheer. The night of November 16th might have been cold, foggy and dreich, but inside Haddo House Chapel all was cosy and colourful. 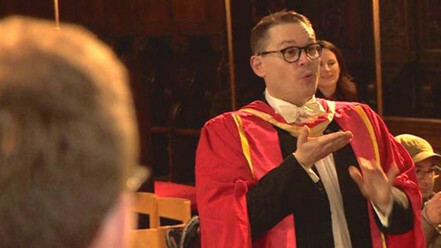 Those who braved the weather had a real treat in store as Prof. Paul Mealor led the University of Aberdeen Chapel Choir through a varied programme. Each piece was introduced by Paul and included some pieces with a remembrance theme. We were very privileged that Paul and the Choir took time out from their very busy schedule, which included trips to New York to perform with Sir Ringo Starr and Sheryl Crowe at a UNICEF fundraising concert as well as performing for the British Ambassador to the US in Washington, to perform for us. 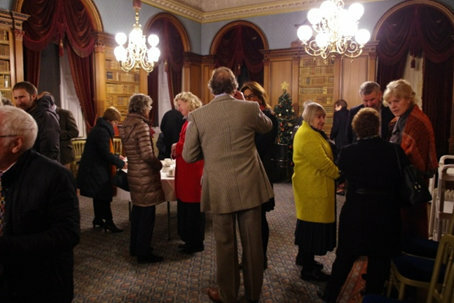 Afterwards Paul and the Choir joined the audience for drinks and canapés in the Drawing and Morning rooms of Haddo House, the perfect setting to round off a memorable and successful evening. Every year the North East Aberdeenshire Members Centre donates the proceeds of the previous year's fundraising to local NTS properties. In 2018 the £1400 donated to Haddo House was used to purchase two sundials in aid of the garden restoration. 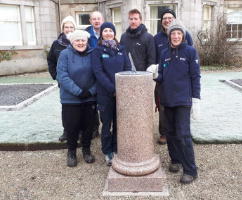 The picture shows a sundial in place with some of the Haddo House staff and lovely volunteers.